Completely lick-able and oh, so, likeable, these cool and creamy frozen pops are made with peach yogurt. These easy to make yogurt pops are as smooth and creamy as ice cream, but because they're made with real dairy, lactose-free yogurt and packed with tummy soothing probiotics, there's no tummy trouble and these pops have a good "pop" of protein (4g) with only 84 calories per serving. 1. Put yogurt, keifer, honey and vanilla in a blender and pulse until smooth. 3. Divide the chopped peaches evenly between the molds, and top off each mold with the rest of the yogurt mixture. 4. 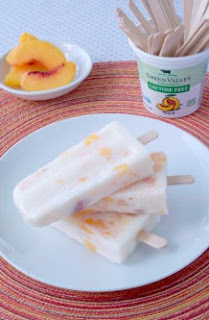 Using a chopstick or wooden skewer, poke the peaches in and around the yogurt mixture, swirling as you move the stick up, down, and around in the mold. 5. Tap molds gently to release any air bubbles. 6. 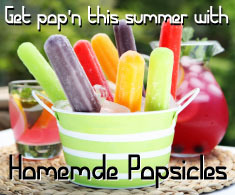 If using a conventional popsicle mold, place the top on the pops and insert sticks. Freeze until sold, about 3-4 hours. If using cups, glasses or unconventional molds, freeze until pops just begin to set, then insert sticks, and freeze until solid. Tips for the perfect Frozen Pop: Buy a traditional mold (there are lots on the market these days or get creative and come up with some unique options of your own. Here are a few we like: juice or shot glasses, tall skinny glasses, paper cups, yogurt cups (this can be a little big, so just fill them 2/3 full. Stock up on sticks from your local craft store. Straight Sticks: To keep frozen pop sticks straight, especially with thinner pop mixtures, soak the sticks in water before inserting and/or straightening the sticks as the pops freeze. Thicker mixtures like yogurt usually don't need adjustment. To unmold one or two pops: Run hot water over the outside of the individual mold for a few seconds. Pull gently to release the pop. If you're un-molding the whole batch, carefully dip the molds into a sink filled with warm water. While it's best to keep the pops in the molds until just before eating or serving, if you need your mold to make more pops, store each pop in it's own unbleached natural was paper bag. Enjoy the pops within a week. 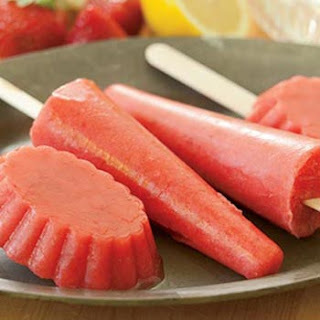 Refreshing Strawberry Lemonade is served on a stick with this yogurt pop. 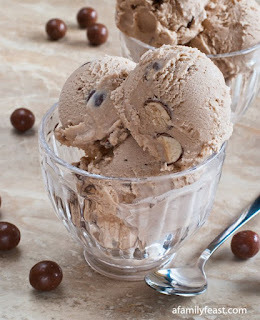 Cool, creamy and satisfying. This pop is made with real lactose-free dairy, tummy soothing probiotics, no high-fructose corn syrup and less added sugar than purchased pops. minutes. Allow to cool to room temperature. Strain and refrigerate until needed. 3. Rinse out blender,add strawberries, honey and water. Pulse until smooth. 4. Pour the yogurt mixture into each of the molds, about two thirds full. 5.Top the molds off with the strawberry puree. move the stick up, down, and around in the mold. 7. Tap mold gently to release any air bubbles. 8.If using a conventional mold, place the top on the pops and insert sticks. Freeze until solid, about 3 to4 hours. If using cups, glasses or unconventional molds, freeze until pops just begin to set, then insert the sticks, and freeze until solid. 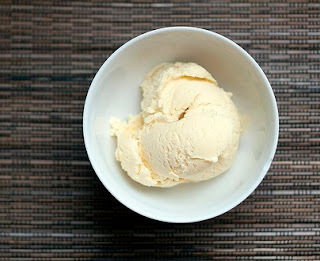 Our goat milk kefir gives this ice cream a delicious tang; similar to frozen yogurt. Malt powder can be found near the powdered milk in the supermarket. Combine first three ingredients in a bowl; stir well with a whisk. Add malt powder, stirring until dissolved. Stir in kefir. Cover and chill. Pour mixture into the freezer can of an ice cream maker; freeze according to manufacturer's instructions. 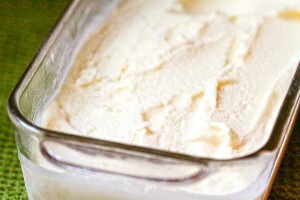 Simple to make, creamy and delicious Gelato! Enjoy one of our favorite recipes for summer developed with Redwood Hill Farm plain goat yogurt from one of our favorite Sonoma County chef’s, Duske Estes, Zazu Restaurant. Drain yogurt through cheesecloth overnight in refrigerator. In a pot, boil water and sugar until sugar is melted; cool. Mix cooled sugar with yogurt. Pour in an ice cream machine and freeze according to manufacturer's instructions. Enjoy! Made with goats milk instead of cream - deliciously creamy ice cream with less fat than commercial french vanilla when you use whole goats milk. Mix sugar, cornstarch and salt in top of double boiler. Gradually whisk in 4 cups of milk, cooking over the boiling water, stirring until it thickens, 12 to 15 minutes. In separate bowl beat the eggs well and add a small amount of the hot milk mix, stirring constantly so that the eggs do not curdle. Add all the egg mix into the milk mix and continue for another 4 to 5 minutes, stirring constantly. Chill thoroughly, preferably overnight. This will improve the texture and allow the flavors to blend.